With the launch of Drego in under 24 hours, this post explains its new /printer feature for anybody who hasn't used it before. If you want to learn more about the Printer mod, please read our 'A Comprehensive Guide to Printer; the Schematica Mod' thread. 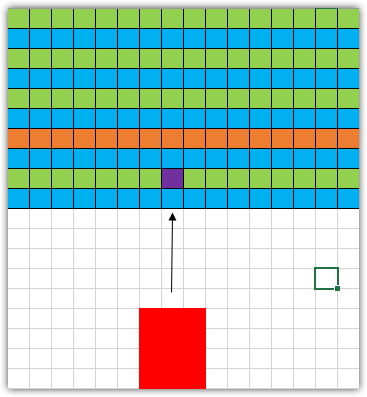 The simple purpose of this feature is to make printing as smooth and as efficient as possible. you'll be placed into a fake creative mode. Drego contains all of Desteria's features as you know them, but transforms the gameplay into a highly competitive environment. This marks our first realm with real cash rewards for the /f top factions. Drego will not continuously release maps, meaning there will be a multi-week break period before we release the next map (unlike the Desteria Plus realms) due to its competitive nature. If you have a youtube channel, you can receive a free 2x Rare Supply Crates at the start of Map 1 if you re-upload this trailer! For more information, join our Discord and see the #trailer channel. With all that said, lets announce the first Season 2 F-Top Winners! All rewards have been sent to the leader's /mail in-game. I'm here to announce the top voters of this last month! If you weren't aware, you can earn rewards from voting! You can find the specifics here. As for the last month of March, here are your winners! All codes will be mailed to everyone in-game within 24 hours of this post. Also as a side note, numbers will be slightly higher than normal due to the double vote weekends we hosted - so keep that in mind. Congratulations to the users who've won. Thank you all so much for taking the time to vote for Desteria. It truly does help a lot. A new month has started so it's time for some updates! We're releasing a new April DP, April Fool's Kit is back in store for a limited time, and we're replacing Vote Crate Drops with Drop Party Crates! 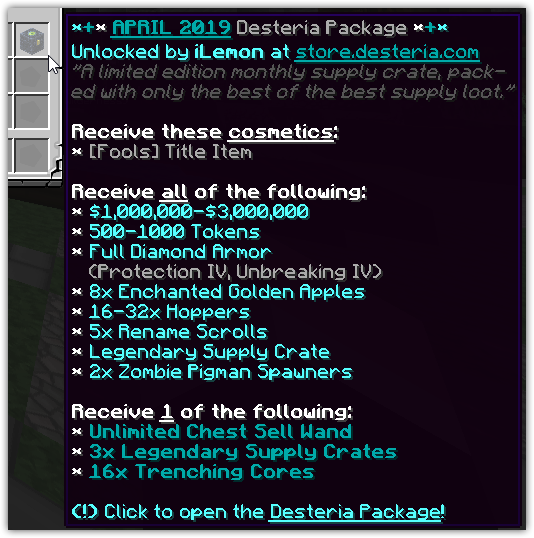 This month's Desteria Package is here!